Heavy metal fan Justin Lee Collins tells the story of the British pioneers who drew up the blueprint for “the Devil’s pop music”. Metal gods like Black Sabbath, Deep Purple, Judas Priest, Motorhead and Iron Maiden, whose vast record sales and enduring influence have made heavy metal the global music phenomenon it is today. In the first programme, find out how heavy metal music started right here in Britain over 40 years ago. Black Sabbath have to take the accolade for being the originators, when they rose from the fiery furnaces of the industrial West Midlands. Their doom-laden rock was the complete antithesis to the hippy movement of the late 60s and the four Brummies soon conquered the world with their monster riffs, dark lyrics and an appetite for rock ‘n’ roll excess. Equally as important were Deep Purple, a five piece band of exceptional musicians whose all-out hard rock music laid down the foundations for all heavy metal bands since: high pitched screams, heavy guitars, a battery of drums and enough testosterone to power an army. And if that wasn’t enough to kick-start a heavy metal revolution, Justin reveals how the arrival of Judas Priest a few years later, would confirm the UK as the epicentre of all things metal. As you may know, BBC shows are typically available for streaming for seven days after they’re aired. Usually I record the shows with Audio Hijack Pro and don’t get around to listening to them until the seven days have passed. In those cases it doesn’t do much good for me to make a recommendation. But for this show, there are still two days left for streaming, and if you’re a fan of early metal—or just amused by it—you will love this show. It’s the first of two parts; the second part airs this Saturday. In keeping with the show’s title, American bands are barely discussed. Bands like Vanilla Fudge and Iron Butterfly1 are mentioned, but the focus is on guys from the gritty industrial north of England (there’s a lot of talk of the gritty industrial north), and that’s as it should be. What makes “British Steel” so much fun? Mostly, it’s the dead seriousness of the presentation. Like the music itself, the show takes something that is, at its root, absurd and treats it with great portentousness. Did you know that Deep Purple was once in the Guinness Book of Records as the world’s loudest band?2 They interview a guy who was in a band called Budgie and act as if it’s perfectly normal. 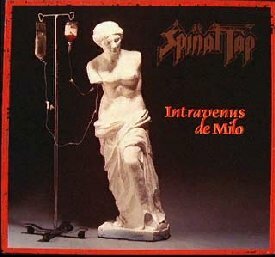 And as the presenter goes through the names of the early Judas Priest albums—done with a reverence befitting a list of fallen war heroes—you swear he’s going to include Intravenus de Milo. Can’t wait for the second episode.